A waterborne rural way of life, the Venice of India. Apart from the obvious charm of seeing life pass on and around the water, there is an immediate practical advantage: peace and quiet. All transport is water-based and man-powered: this must be the only community in India without honking auto rickshaws, screeching scooters, or loud rickety cars. Enjoy the beautiful green scenery while giving your ears some rest. 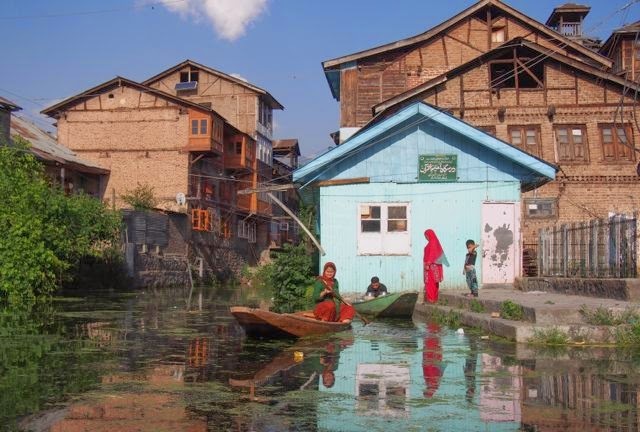 The outskirts of Dal Lake, Srinagar's principal body of water, fabled for its houseboats. (Between Nagin Lake and Dal Lake: Map. 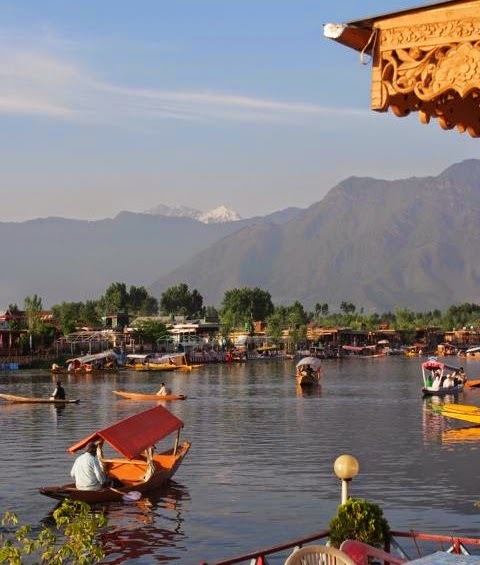 The shores of Dal Lake are abuzz with tourists. FOR MANY FOREIGNERS Kashmir still connotes disturbances, bombs and violent mobs determined to separate from India. 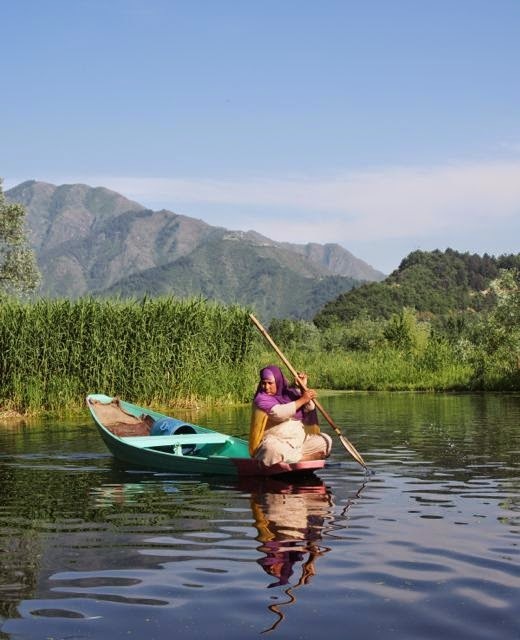 These days, the mobs you encounter in Srinagar, the Valley's historical capital, are vacationing middle-class Indian families, determined to have a good time while staying on a houseboat on Dal Lake. Party time! 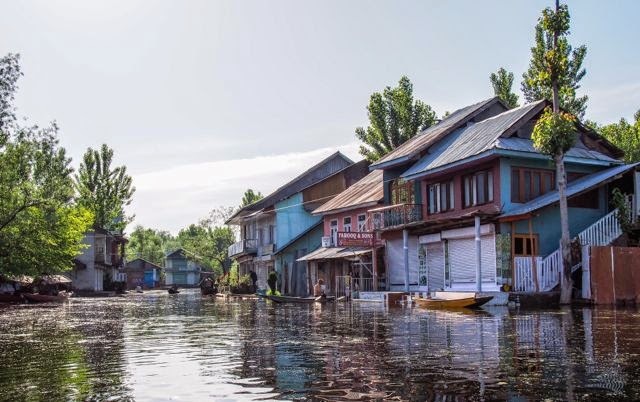 The shores of Dal Lake are lined with houseboats, many of them beautiful, and at certain hours the tourists all take their 'must-do' shikara ride which means the Lake is as busy (and noisy) as a Delhi roundabout at rush hour. The canoes and boats used don't use any engines- it's all run on manpower. This means it's a delightfully quiet journey with a 30 decibel drop compared to almost anywhere else in India, where even villages can be ear-splitting loud thanks to the joys of modern transport. 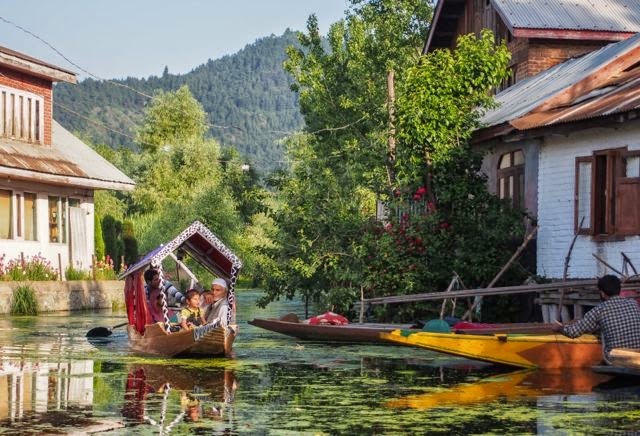 On the Dal Lake backwaters, you'll mostly be disturbed by the cries of waterbirds and kids playing, and all is muffled by lush greenery. Pleasant as it is for us visitors, for the people who live here the backwaters are just their homes and villages, and they go about their business much like everywhere else. You will find children coming home from school, women doing their shopping, workshops for wood carving, embroidery and papier mâché (many of the souvenirs for the tourist industry and manufactured here and undoubtedly you'll be invited to have a look- and more!). Family on their way home. A typical 'street'. See where the notion of 'Venice of India' comes from? 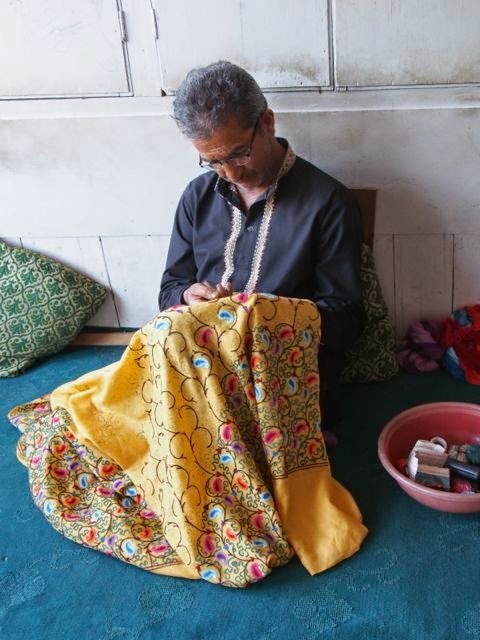 Srinagar is ground zero for woodcarving and you will see plenty of workshops around- and the results proudly displayed on the houseboats. 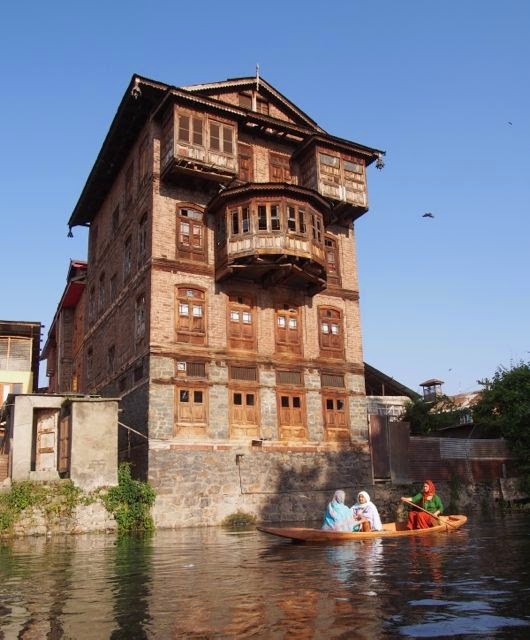 Kashmiri traditional architecture is quite distinct. Made of brick and timber, and often with overhanging windows that seem reminiscent of Ottoman architecture. Even Kashmiri mosques are quite different, generally lacking minarets. 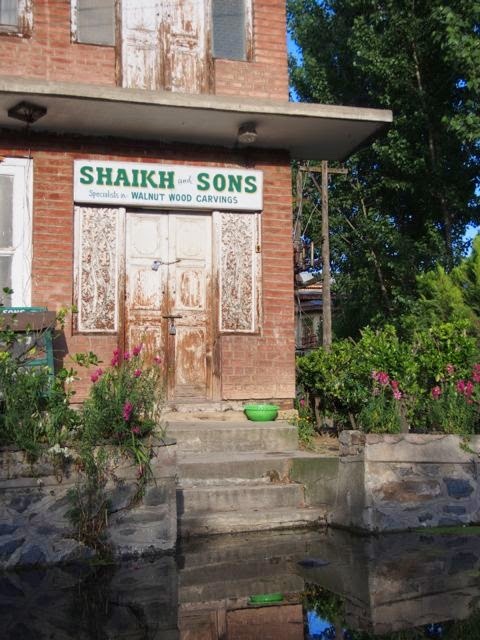 Beautiful Kashmiri brick and timber house with overhanging windows. By boat, obviously. 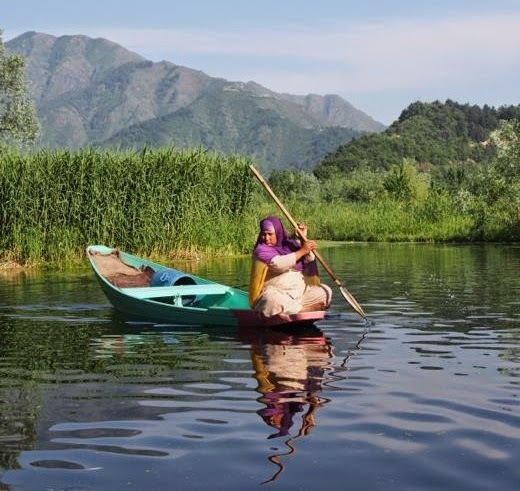 You will need to arrange a shikara (hand-peddled water taxi) to take you away from the busy areas of Dal Lake and into the network of waterways that connect a number of rural villages. Not all shikara owners may be familiar with this area (or understand why a tourist may want to venture there!) Ask a houseboat owner for help. Young Bombay Houseboats can help arranging a backwater trip and has reliable Shikara boatmen on call. headed to srinagar next week and this is much appreciated. well done. Hope you enjoyed your trip Jack. How did it go? Lovely pics! Cannot wait to visit soon! Hello! Amazing post, do you have any place to stay that you recommend in the lake? Not sure if it's worth staying in a house boat but I was thinking about the island hotel or the Golden Hopes Group of Houseboats but not sure the best area on the lake to stay the night. when is a good time to visit the backwaters, early morning? Hi Maria, I stayed at Young Bombay Houseboats- the link to contact them is in the 'useful links' section at the end of the article. I was very happy with them. You can use a site like booking.com and find a houseboat with a good rating. Definitely stay on the lake. I did several visits at different times of day. All were fine in my experience. End of July! I will definitely book an houseboat then! Yes, roughly. 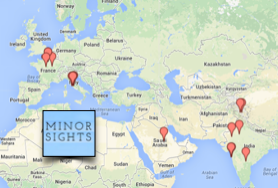 The Minor Sights map shows you the area. It's the whole stretch between Dal Lak and Nygeen Lake, which is cross-crossed by small water lanes.